Dallas Guitar Academy offers class lessons, private guitar and bass instruction, master classes, and artist clinics in North Dallas, Texas. All DGA instructors are experienced music teachers with confirmed references and degrees and/or certification in their chosen fields of expertise. Written letters of recommendation for all DGA instructors are available upon request. The DGA accreditation process means that you can be confident your DGA experience will be positive, with the highest standards of professionalism and customer courtesy. Attractive Gift Certificates suitable for birthday or holiday giving are always available. Please Contact DGA for more info. Beginning Guitar Class - Open to all beginners age 13 and up, or intermediate players who want the review. Begins with holding and tuning your guitar, names of guitar parts, and quickly progresses to chords, scales, tabulature, and playing basic songs. A variety of styles are introduced to encourage students to explore and find the styles they like best. Classes are organized according to age and skill level, so it's an easy way to make new friends too. Classes start every month and may be repeated as often as you like. Cost is $70 per month (4 hours). Intermediate Guitar Class - Open to all ages, from age three to one-hundred sixty-three, but an audition or permission from the instructor is required. This class is intended to be challenging. Topics covered may include movable bar chords, song forms, repertoire development, fretboard mapping, improvisation, and other advanced techniques. New classes start every month and may be repeated as often as you like. Cost is $85 per month (4 hours). DGA Master Classes - Pricing and scheduling vary. Please let us know what you'd like to learn or what kind of events you'd like to see sponsored or hosted by DGA! Individual Option - Individual lessons are $60 per hour. No contract, no sign-up fee, just PAY AS YOU GO. If you're not 100% satisfied with your lesson, it's FREE. Payment is due at the time of your lesson. Availability per instructor. Monthly Option - Minimum 3 lessons per month. Guarantees the same lesson time every week per arrangement with your instructor. $35 per half-hour and $60 per hour. Monthly tuition is PAID MONTHLY IN ADVANCE at the last lesson of each month. Semester Option - $120 per month half-hour / $200 per month full-hour. Semester students pay their first and last month's tuition upfront and are guaranteed no price increases for as long as they remain enrolled. Semester students agree to provide 30 days advance written notice to discontinue lessons, at which time their pre-paid final month's tuition is applied. Some months have 3 lessons and others have 5 lessons, with an average of 4 lessons per month. Semester tuition is PAID MONTHLY IN ADVANCE at the last lesson of each month. Make-up Policy - 24 hour advance notice required to receive make-up credit. Make-up lessons may be either private or group lessons, based on your instructor's availability. If an instructor misses a lesson for any reason, a full cash credit will be applied to the following month's tuition. If you must miss a lesson, please be courteous and give your instructor as much advance notice as possible. String$: When you're done playing, wipe your strings with a cotton cloth or old T-shirt that's been treated with a small amount of light household oil such as WD-40. This cleans the strings and displaces moisture that can shorten string life. This simple process will extend string life 3 to 4 times compared to untreated strings, saving you money, and giving you more time to spend playing your guitar instead of changing strings. How to Get a Good Starter Guitar - Whether for yourself or as a gift for someone else, the right guitar can mean the difference between success and failure. THIS ARTICLE covers the basics of finding a good starter instrument within your budget. 14925 Midway Road, Suite #107, Addison TX, 75001. 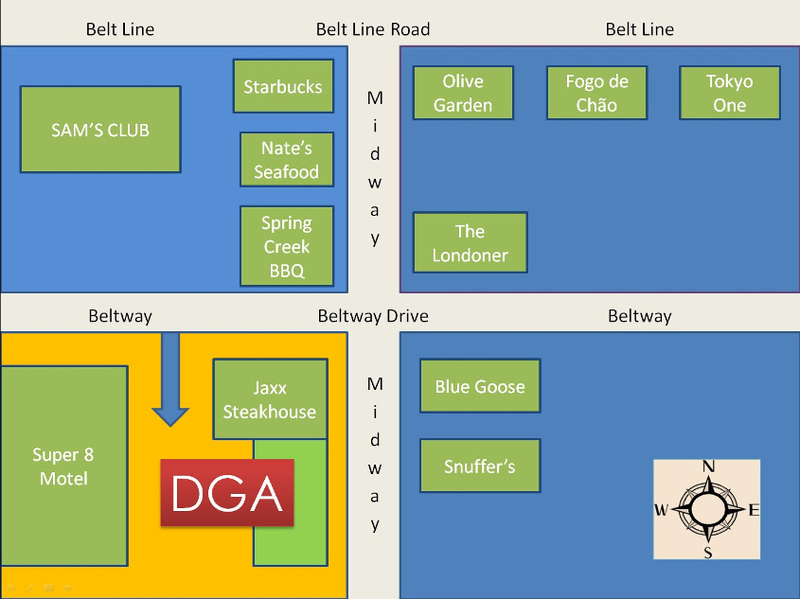 We are on the southwest corner of Midway and Beltway, one block south of Belt Line Road. If you call and get our voicemail, please leave your name, number, and a good time to return your call. We try to return calls within 24 hours!